Snap up one of the best USB flash drives to ensure your files can be taken with you conveniently, and safely. They are absolutely everywhere and ubiquitous to world now, not just the realm of PC-ing, but USB flash drives are still useful and have their place. They are so common, they will often get tossed aside, but they are still useful for easily transporting and sharing information and files—I did this recently with wedding pictures and videos—providing an extra backup point for those who like extra reassurance, and, given their impressive capacities nowadays, they can be useful to the gamers too. Therefore if you're looking for one of the best USB flash drives to take your files with you in the most convenient way, then this guide is for you. 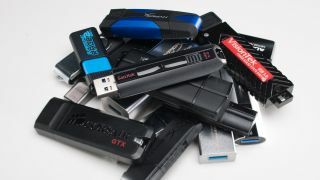 Instead of rushing to retailers and buying any old item that's early on search lists as this is almost a certain way to get burned, so swat up here on some of the best going and you'll soon know what to look for, both good and bad, when it comes to picking up one of the best USB flash drives. This way you’ll get something that will last longer, and maintain a high level of quality. Because they are unbelievably common, there is an enormous range of shapes, speeds, prices and specs on offer. We’ve tested a range of the best USB flash drives and these are the ones you should consider going for. Everyone wants their file transfers to go faster, but who wants to pay for it? You don’t have to spend much money to get a significant boost in power, though, and the 32GB SanDisk Extreme CZ80 is proof of that. Out of all the drives I tested, it represents the most bang for your buck. The most impressive thing about this drive is that its speeds aren’t anywhere near the budget category, despite the price. In the large file test, it averaged a read speed of 229 MB/s and a write speed of 178 MB/s. Though that test didn’t reach its advertised speeds (245 MB/s read; 190 MB/s write), it came very close and actually surpassed those numbers in the CrystalDiskMark (CDM) test. Its small file testing proved somewhat worse for read speed, 123 MB/s, but still ahead of any competitors (by pricing) for write speed, 56 MB/s. These numbers actually come close to the drives I was testing in the high-end category—including the “pro” version of the CZ80, the SanDisk Extreme Pro CZ88—but at a significantly cheaper price. The CZ80 is also one of the nicer looking and easier to use drives I tested. It’s slim and smooth design has a slider to push out the USB plug. The slider has a bit of a spring action to it, meaning you only have to push it part of the way and the drive does the rest of the work for you. It has a catching mechanism when the plug end is pushed out but not when it’s pulled in, making it easy to quickly “uncap” while also preventing you from pushing the end back in while you trying to plug it into your computer. The keychain loop is also quite large, making it much easier to thread than most of its competitors. There are definitely faster drives and there are definitely cheaper options, but the CZ80 strikes a great balance between the two. It actually feels under-priced for the speeds it can reach. It’s such a fast drive that I can confidently recommend that this is the one you should get, even if you have extra money to burn. Going higher than this will get you more speed, but at an extra price that probably isn’t worth the money. We’ve covered the drive that strikes a balance between price and power, but what if you just want the fastest USB drive you can get your hands on? That’s exactly what the 128GB Patriot Supersonic Rage 2 brings to the table. It’s got more storage than my personal rig’s SSD—and it costs more—but it has a lot of speed and space in a tiny package. In fact, it’s probably the tiniest way to store this much data available. With the second-highest advertised read and write speeds of all the drives we tested, I had high hopes but realistic expectations. The Rage 2 is listed as having a read speed of 400 MB/s and a write speed of 300 MB/s, and while it predictably didn’t reach those high numbers it actually came surprisingly close. The large file test averaged 354 MB/s read and 187 MB/s write, while the small file test clocked in at 180 MB/s read and a much lower 34 MB/s write. That write speed may seem damning, especially when put next to the 300 MB/s it claimed to get, but it’s important to keep in mind that pretty much every drive I tested performed drastically worse in the small file test than any other benchmark. Only a few of the drives made it above 40 MB/s write for that test, while only one managed beat the Rage 2’s small file read speed. The Rage 2’s form factor is one of my favorite things about it, and one of the primary reasons I chose it over its closest competitor, the Corsair Flash Voyager GS. Even though it holds 128GB (there are also 256GB and 512GB versions) it’s one of the smallest drives I got my hands on. It’s slim, flat, and its sliding cap means it takes up even less space when you plug it in. It was difficult to understand why some of the other drives were so bulky while the Rage 2 was designed to be so sleek and small. There is value in making a drive difficult to lose track of, but the Rage 2’s bright colors and easy-to-use keychain loop meant that wasn’t a concern. Additionally, it left all the other drives in the dust in terms of read speed. This is why the Rage 2 really shined; while other drives could beat it in certain tests, no other drive was so consistently at the top of every test. Put that in an attractive case and you have the best high-end USB drive money can buy. Your average gamer isn’t going to need the amount of storage the Patriot Supersonic Rage 2 provides, but everyone can benefit from the speed. If you transfer files on a daily basis and want to gain back hours you’ve wasted waiting on slow transfers, this drive is your answer. If you're looking for a good, cheaper option, the 16GB ADATA Superior Series S102 is a worthy contender. It's wrapped in a durable body, doesn’t cost much more than lunch, and it blows crappy USB 2.0 drives out of the water. The S102 is advertised with 100 MB/s read and 50 MB/s write speeds, and ended up testing pretty close to those numbers. It actually reached 116 MB/s read in the large file test, but it never quite hit its listed write speed, only averaging 36 MB/s. Still, these are pretty impressive speeds for a $10/£10 (ish) drive, and its speed consistency was a good sign. The small file test saw a read speed of 84 MB/s and a write speed of 21 MB/s but, as I’ve said before, most of the drives I tested performed much worse with small files than large ones. Overall, it had decent and consistent speeds at a price much lower than you’d expect. The S102 has a metal body and a removable plastic cap instead of a slider. I’m usually not a fan of caps, but this one has a catching mechanism that keeps it very securely in place. It can also be snapped onto the back of the drive when it’s plugged in and works well enough that it won’t just fall off with a slight bump. My fear with removable caps is that I’ll inevitably lose them, but this one feels hard to lose. The S102 is definitely not the fastest drive I tested, but you get a surprising amount of power for a very low price. A few dollars might not be much at higher prices, but when the drive is $10 it can make the difference. And if you are willing to spend a few dollars/pounds, you can double the storage capacity to 32GB. If you don’t want to spend around $20/£15 on a USB drive, then the ADATA Superior Series S102 is the way to go, especially over an outdated USB 2.0 drive. The S102 will give you a noticeable and significant boost in speed for a very small price. It also has one of the nicest forms of any of the drives I used, regardless of price or speed. Now that we’ve covered your best speed options at different price points, it’s time for something a bit different. Low-profile USB drives are ones that barely extended past the edge of the port you plug them into, and the best one you can get is the 32GB SanDisk Ultra Fit CZ43. A low-profile drive needs to be as small as it can possibly be while still staying functional, both in speed and convenience. It shouldn’t take up room, but you should still be able to fit it on your keychain or get it back out of the plug after you’ve put it in. The CZ43 wasn’t the fastest drive I tested but it was definitely faster than any USB 2.0 drives and provides a worthy upgrade. In the large file test it had a read speed of 129 MB/s and a write speed of 31 MB/s, while in the small test it averaged 87 MB/s and 22 MB/s. These speeds aren’t amazing, but you shouldn’t be looking at the CZ43 if you’re only concerned with a drive’s speed. The shape and form factor is what really counts when looking at low-profile drives, and the CZ43 shines here more than anywhere else. The drive hardly juts out of the USB port at all, and its end is rounded black plastic which allows it to pretty much disappear against your computer while plugged in. The end also has a red LED hidden under the plastic that acts as an indicator light when it’s getting power. The light is very helpful in making sure the drive is in all the way, and is otherwise completely unnoticeable. Admittedly, the keychain loop is a little bit difficult to thread and the CZ43 comes with a cap that has nowhere to go while the drive is in use. I usually don’t like free-floating caps on USB drives, but since this one isn’t much more than the plug end itself, the extra protection while it’s in your pocket is appreciated. Once again, it wasn’t the fastest drive I tested, but it was definitely the smallest. Realistically, the speed difference compared to other low-profile drives is negligible, and the CZ43 is slightly cheaper anyway. The smoothed black end also made it more aesthetically appealing while plugged in and easier to remove. For the record, no low-profile drive is easy to unplug once it’s in there, but this one was the easiest. A low-profile drive definitely isn’t for everyone, but if you are specifically looking for one then the SanDisk Ultra Fit CZ43 is the way to go. If you are looking for extreme speeds while still staying relatively small then the high-end Patriot Supersonic Rage 2 will still satisfy but at a much higher cost. After a lot of testing and spending some practical time with each drive, the SanDisk Extreme CZ80 is the USB drive I’d recommend to PC gamers. Its read and write speeds are up there with the fastest ones I tested, but at a much lower price. It even outperformed its “pro” version in some of the tests I ran. The CZ80 has a slim body that doesn’t take up much space and doesn’t block any other ports. It’s the perfect example of how paying only a little bit more for a good USB drive can represent a significant step up in quality. USB drives might not have much to do specifically with PC games, but every PC gamer will need one at one point or another. As PC gamers, we always want the best and the fastest when it comes to our computers, but our choice of portable drives will often fall to the wayside. Using any old USB drive seems fine, until you end up waiting 30 minutes to transfer a file. When it comes to testing USB drives, speed is king. A drive's read (taking files off of it) and write (putting files onto it) speeds determine how long you’re going to be waiting on file transfers. Read speeds are almost always higher than write, so a drive with a high write speed is a treasure. Additionally, a drive will read and write differently depending on the size and quantity of the files being transferred, so it needs to perform well in multiple scenarios. Beyond raw speed, a USB drive needs to be convenient and comfortable to use. Does it block adjacent USB ports? Does the cap snap onto the back or sit idly on your desk when it’s off? And finally, what are you paying for the performance? I primarily tested all of the drives on our living room gaming machine, LPC Jr., with follow-up testing and some double checking on another equally powerful rig. For consistency, I formatted all the drives to NTFS before I moved any files onto them and used the same USB 3.0 port on the motherboard I/O panel every time. I also ran all the tests in the same order and didn’t use the drives for anything else before I tested them. Some of the drives I recommend are a different capacity than the ones I tested of that model. While larger drives generally read and write faster, I made sure that all the drives I was comparing for a category were the same size for consistent results. Each drive went through the same testing process: a benchmark using the CrystalDiskMark software, a practical test of transferring lots of large files, and a practical test of transferring lots of small files. While a drive's read and write speeds are usually their most important factor, I also took price, form factor, ease of use, shape, and other such things into consideration while testing. The first test was fairly straightforward: I used the Standard Edition of CrystalDiskMark to get a baseline idea of what to expect from each drive. CDM tests the read and write speed of each drive in four different ways: sequential; random 512K; 4KQD1; and 4KQD32. The most important number to look at here is the sequential speeds as that’s what reflects how we access files from a USB drive. The random 512K and 4K tests would be important if you are planning on installing an OS onto your drive, but are less indicative of its practical performance. While I did take the CDM results into consideration, I found that the sequential read and write speeds from the benchmark were consistently higher than what I got in the practical tests. The CDM speeds represent the ideal scenario of what the drive can do, often starting out at this number but slowing down during large bulk file transfers. Therefore, I used the CDM sequential speeds as a baseline for my judgement, but placed more value in the practical tests. For both the large and small file tests I used a program called RoboMirror, which adds a GUI to the Windows utility Robocopy. Using RoboMirror is the exact same as dragging over the files manually, expect it keeps careful track of how long a copy job took and lists the average MB/s speed. This way, I could perform real world tests of moving files to and from the USB drives and get precise numbers on how quickly the drives were working. The first practical test was with large files. I made a folder of roughly 32GB of video files, 20 total ranging from 1-2GB in size, and copied them all at once to a USB drive using RoboMirror to get the write speed. I then copied them back to the computer to get the read speed. For the 32GB drives, I used a folder with 16GB of files instead and did the same with the drives I was comparing them against to stay consistent with the tests. The second practical test was with lots of small files. I made a folder of roughly 15GB of images, almost 10,000 total. I copied them to and from the drives, making note of the read and write speeds. Storage devices handle a bunch of small files differently than large ones, so testing both ways let me see how it would perform in a few different situations.